Not only that we have some of the most BEST PRICES in the UK but our Professional Pizza Ovens are also of the highest quality, suitable for Commercial, Heavy Duty and Industrial Use making it the perfect addition to any restaurant and pizzeria. Traditional Style Dual Fuel Wood-Gas Pizza Oven (Mix-R) MIX85RK SiliconeWith Rotating BaseThe oven comes in 1 (size) with a volume/capacity based on 12”/30Cm Diameter Pizzas. ModelVolume/Capacity Output WeightGPL ConsumptionNatural Gas Consumption Firewood ConsumptionMIX85R5 pizzas75 pizzas p/h 950Kg1.7 Kg/h 3.0 mc/h 3-4 Kg/h Technical Specifications Double front doors - Wood chamber & cooking chamber.Wood combustion chamber separated from the baking surface & drawer to collect ashes from the burning wood.Features a rotating cooking base, giving a more uniformed performance, higher productivity & better working conditions are achieved as pizza peel with a shorter handle is used.Rotation speed can be gradually increased & rotation direction can be reversed.The baking chamber is dome shaped, allowing even baking & economical use of wood.The wood burns in the chamber of the oven thus giving the pizzas a specific aroma.The close distance of the burning wood gives each pizza a golden brown colour once cooked.Heating up of the chamber uses an ecological burner with the use of NATURAL GAS or LPG.Easily control the temperature of the cooking chamber by a digital controller.The dome shaped chamber is manufactured using refractory materials with a very high percentage of Aluminium Oxide (A12O3), which makes it extremely strong & wear resistant.The considerable thickness of insulation helps in achieving maximum energy efficiency.All elements of the oven are placed in a case which allows its mobility. The Wood Fired Oven comes in different colour patterns. Please select the one required!On request, other colours are available.The oven requires a Gas pressure of: NG - 30-37mbar. LPG - 20mbar. Dimensions.. Traditional Style Mix Wood-Gas Pizza Oven (Series Mix-V) MIX120VA wide range of commercial mix gas and wood fired pizza ovens ideal for heavy duty use. Our professional ovens are the perfect pizza equipment for restaurants and pizzeriasThe Mix-V series is represented by mix wood-gas pizza ovens featuring a double front door, a wood combustion chamber that is separated from the baking surface, and a drawer the collect ashes from the burning wood.They are made of vibrated refraction material with high percent of two-aluminium-three-oxide (Al 2O3), which guarantees high wearing out resistance and sturdiness. It is built of large monolithic segments and periodical luting is not needed, as it is with the ovens made of bricks. Practically this chamber is eternal and does not demand any maintenance.The domical shape of the baking chamber guarantees an even baking at low gas consumption. Insulation materials with low coefficient of heat conductivity have been used. The considerable thickness of insulation helps to achieve maximum economy. All elements of the oven are placed in a case which allows its mobility.Heating up of the chamber uses an ecological burner, which works with NATURAL GAS or LPG and a recirculating fan. The fan maintains the optimum temperature of the oven floor and prevents it from getting cold even at very intensive work. The used gas recirculation /thermal cycle helps achieving an extraordinary energy consumption. The temperature is digitally controlled and the burner power can be modified by using the Electronic Modulator in the range of 5-100%.Electrical supply - 230 V/50-60 HzAll elements are placed in a metal case which allows the oven to be easily moved. The oven comes in 2 (sizes) to address everyone’s needs, with different volume/capacity based on 12”/30Cm Diameter Pizzas. Model Volume/Capacity Output Weight GPL Consumption Natural Gas Consumption Firewood Consumption MIX120V 9 pizzas 135 pizzas p/h 1950Kg 1.9 Kg/h 3.3 mc/h 5-6 Kg/h MIX140V 13 pizzas 195 pizzas p/h 2100Kg 3.2 Kg/h 4.2 mc/h 6-7 Kg/h The oven requires a Gas pressure of: NG - 30-37mbar. LPG - 20mbar. Dimensions.. Traditional Style Mix Wood-Gas Pizza Oven (Mix-R) MIX120RA wide range of commercial mix gas and wood fired pizza ovens ideal for heavy duty use. Our professional ovens are the perfect pizza equipment for restaurants and pizzerias.The Mix-R model is a mix wood-gas pizza oven featuring a rotating cooking base, which returns an increased performance, higher productivity & better working conditions facilitating the use of a shorter pizza peel. The rotation speed can be gradually increased and can be reversed as well.The oven features a double front door, a wood combustion chamber that is separated from the baking surface, and a drawer the collect ashes from the burning wood.It is made of vibrated refraction material with high percent of two-aluminium-three-oxide (Al 2O3), which guarantees high wearing out resistance and sturdiness. It is built of large monolithic segments and periodical luting is not needed, as it is with the ovens made of bricks. Practically this chamber is eternal and does not demand any maintenance.The domical shape of the baking chamber guarantees an even baking at low gas consumption. Insulation materials with low coefficient of heat conductivity have been used. The considerable thickness of insulation helps to achieve maximum economy. All elements of the oven are placed in a case which allows its mobility.Heating up of the chamber uses an ecological burner, which works with NATURAL GAS or LPG and a recirculating fan. The fan maintains the optimum temperature of the oven floor and prevents it from getting cold even at very intensive work. The used gas recirculation /thermal cycle helps achieving an extraordinary energy consumption. 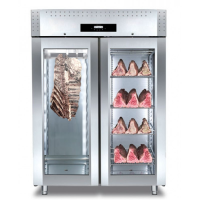 The temperature is digitally controlled and the burner power can be modified by using the Electronic Modulator in the range of 5-100%.Electrical supply - 230 V/50-60 HzAll elements are placed in a metal case which allows the oven to be easily moved. 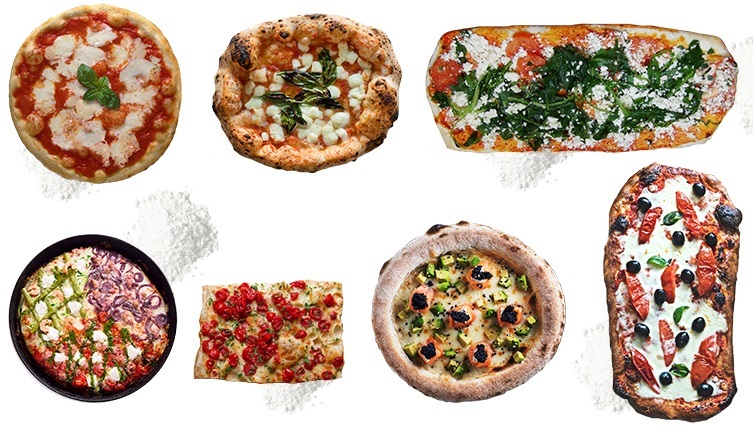 The oven comes in 1 (size) with a volume/capacity based on 12”/30Cm Diameter Pizzas. Model Volume/Capacity Output Weight GPL Consumption Natural Gas Consumption Firewood Consumption MIX120R 9 pizzas 135 pizzas p/h 1950Kg 1.9 Kg/h 3.3 mc/h 5-6 Kg/h The oven requires a Gas pressure of: NG - 30-37mbar. LPG - 20mbar. Dimensions.. Traditional Style Mix Wood-Gas Pizza Oven (Mix-R) MIX120RK MosaicThe Mix-RK model is a dual fuel wood-gas pizza oven featuring a rotating cooking base for an increased performance, higher productivity & better working conditions facilitating the use of a shorter pizza peel. The rotation speed can be gradually increased and can be reversed as well.The oven features a double front door, a wood combustion chamber that is separated from the baking surface, and a drawer the collect ashes from the burning wood.It is made of vibrated refraction material with high percent of two-aluminium-three-oxide (Al 2O3), which guarantees high wearing out resistance and sturdiness. It is built of large monolithic segments and periodical luting is not needed, as it is with the ovens made of bricks. Practically this chamber is eternal and does not demand any maintenance.The domical shape of the baking chamber guarantees an even baking at low gas consumption. Insulation materials with low coefficient of heat conductivity have been used. The considerable thickness of insulation helps to achieve maximum economy. All elements of the oven are placed in a case which allows its mobility.Heating up of the chamber uses an ecological burner, which works with NATURAL GAS or LPG and a recirculating fan. The fan maintains the optimum temperature of the oven floor and prevents it from getting cold even at very intensive work. The used gas re-circulation /thermal cycle helps achieving an extraordinary energy consumption. The temperature is digitally controlled and the burner power can be modified by using the Electronic Modulator in the range of 5-100%.Electrical supply - 230 V/50-60 HzAll elements are placed in a metal case which allows the oven to be easily moved. The oven comes in 1 (size) with a volume/capacity based on 12”/30Cm Diameter Pizzas. Model Volume/Capacity Output Weight GPL Consumption Natural Gas Consumption Firewood Consumption MIX120R 9 pizzas 135 pizzas p/h 1950Kg 1.9 Kg/h 3.3 mc/h 5-6 Kg/h The oven requires a Gas pressure of: NG - 30-37mbar. LPG - 20mbar. Dimensions..